Queen Elizabeth was launched in 2010 as the third ship in Cunard's fleet and a sister to Queen Victoria, which entered service in 2007. Both sisters' hulls are based on a blueprint shared with numerous other vessels in the Carnival Corporation family. Among them are Holland America's Eurodam and Nieuw Amsterdam, P&O Cruises' Arcadia, several of the Costa ships and Carnival Cruise Lines' Spirit-class vessels. 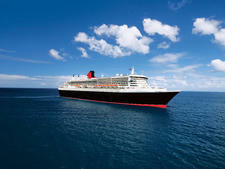 So, essentially, Queen Elizabeth is a cruise ship in design, not an ocean liner like Cunard's flagship, Queen Mary 2. Queen Elizabeth is similar in many ways to its sibling, Queen Victoria -- in most of the layout, cabins and enrichment programs, for example -- but different in others. The decor somehow feels lighter, with chic, geometric Art Deco-inspired interiors, as opposed to the heavier Victoriana. Everywhere you turn, there's beautiful artwork, rich Italian marble, polished wood and soft light, diffused by glittering chandeliers. The rippling sounds of a harp, mellow piano or string quartet throughout the public areas enhance the whole feeling of old-fashioned glamor. There's no neon or glitz on this ship, and there are few gimmicks. Instead of capturing the public's imagination with waterslides and high-tech nightclubs, Cunard cashes in on its impressive heritage, a sense of occasion and old-fashioned pursuits like ballroom-dancing, lawn bowls or afternoon tea in the Garden Lounge. Some spaces differ from those on the near carbon copy of Queen Victoria, partly as an evolution and partly to reflect the famous dining rooms and bars of the original Queens, Mary and Elizabeth. The Britannia Club, one of four main dining rooms, replaces the Chart Room bar on Queen Victoria, while the Todd English specialty restaurant becomes The Verandah. This restaurant, helmed by Cunard's executive chef, is reminiscent of the glory days of the first Queen Elizabeth and Queen Mary, on which the Verandah Grill was regarded as the finest restaurant at sea. Also new is an AstroTurf-covered Games Deck, dedicated to traditional English garden pursuits. The Midships Bar, another much-loved Cunard feature, is back, as is the Yacht Club nightspot, a lounge fondly remembered by fans of QE2 for its late-night dancing. Despite the fact that Cunard is American-owned, there's no shortage of British icons like a Fortnum & Mason hamper ordering service, Harris Tweed for sale and a sunlit Garden Lounge that's inspired by the glass houses of Kew Gardens. Extensive use has been made of cream and chocolate marble, as well as polished wood in the public spaces. Every bar or lounge has something beautiful in it, whether it's a piece of intricate wooden marquetry or an evocative painting of a maritime scene. Everywhere you look, there's Cunard memorabilia: a Christmas card from Queen Elizabeth II displayed in a glass case, a solid silver model of QE2 made by the famed London jeweller Asprey and the original bell of the first Queen Elizabeth. Add these genuinely beautiful surroundings to the glamorous history on which Cunard trades, and you might think you're in for a luxury cruise. But you're not, necessarily. Queen Elizabeth, like the other Cunard ships, operates a class system in which the cabin grade you choose dictates where you eat. Queens Grill and Princess Grill do represent some of the loveliest accommodations and most exclusive dining at sea, which is reflected in the price. But the vast majority of passengers -- 83 percent of them -- are in Britannia-grade cabins, dining in the Britannia Restaurant or the slightly more posh Britannia Club. And what they experience is essentially a product of the Carnival family: food that's OK but not spectacular and the same nickel-and-diming that you'd find on any other big ship (charging for water in cabins and on shore excursions, for example), just in a very smart setting. Some niggles, for example: In the Lido buffet, at breakfast, the waiters do not help you find a seat or carry your tray or even pour water or fetch tea and coffee. You have to line up at a machine for that. While the Britannia Restaurant is beautiful to look at, we found service to be hurried. And, while some things look very chi-chi and elegant, they're not, particularly. Afternoon tea in the Queens Room was the same scones, sandwiches and not-very-exciting cakes that were on offer in the Lido buffet. There's a fee for the extra posh afternoon tea. In some areas, the service lacked finesse. We were struggling with a heavy bag, watched by several crewmembers, none of whom offered to help. The ID card scanner broke down as several shore excursions were returning to the ship, but nothing was done to speed up the re-embarkation process; passengers were getting flustered, and the crew didn't seem to care. However fancy the top suites on this ship, and however attentive the service in the Grills, there are still elements of the service in the main public areas of the ship that doesn't meet expectations. If you're looking for top-notch service, you might find you only get that real extra touch in certain areas of the ship. Who sails on Queen Elizabeth depends on where the ship is going. Ex-Southampton cruises inevitably attract a lot of Brits. The handful of mini-cruises that operate every year are a big chance for first-timers to try Cunard and attract a more economically diverse crowd than usual. The annual world cruise draws a mixture from all over the globe, although there are large numbers of well-heeled Americans and Brits. Shorter voyages also attract Americans and Brits, but Cunard's ships are very successful in the Japanese and German markets, as well. Everybody who sails has a fascination with the great Cunard name, whether they're die-hard Cunard regulars (and this brand inspires a lot of loyalty) or those who have heard about the ships and are curious to try them. It can lead to a nice cosmopolitan mix; on a two-week Black Sea itinerary, 43 different nationalities were onboard. During the day, stylish casual wear, including smart jeans and shorts, is fine onboard. Swimsuits, sarongs and gym wear are allowed pool-side, on deck and in the spa and fitness center, but passengers must be covered up in any other areas of the ship. The onboard currency is the U.S. dollar. 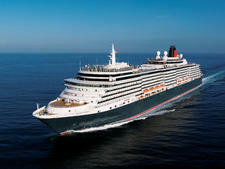 Cunard recommends $11.50 per person, per day, for Britannia-grade cabins and $13.50 per person, per day, for Grills. Fifteen percent service is added to all drinks and spa treatments, and there's a line left blank on the receipt for the extra tip. The daily gratuities are added automatically onto your onboard account. On our mini-cruise, a few people were giving the staff at the Purser's Desk a hard time on the last night, trying to remove or reduce the gratuities, or redirect them to crewmembers they felt were most deserving. This was handled graciously.